Citadel is a well known, open source, completely free Groupware/collaboration application suite which comes bundled with scheduling/calendaring, email, tasks, and file sharing/management applications. It lets users work on mutual tasks and collaborate easily for the fulfillment of their targets and goals. It is developed in C language and has gained massive popularity over the passage of time due to its ease of use and abundance of features. Here are some of the noteworthy features of this collaboration application suite. It offers shared calendar and contact management system. It comes with advanced and state of the art email system supporting IMAP, POP3, ESMTP authentications. It provides awesome address book and bulletin boards features. Instant Messaging and RSS Feed aggregation features add feathers to its cap. It lets you use popular web servers like Apache, Lighttpd, or Nginx etc as http proxies. It provides multiple domain support and server side spam filtering. Let’s see how we can install it on Ubuntu Linux 15.04 and Linux Mint operating systems. Due to the popularity of this application suite, it is already part of Ubuntu/Mint Package Manager repositories. Launch your system terminal and run following command to install it. During the installation process, it will launch the configuration wizard, on the very first step, provide the address for Citadel server. 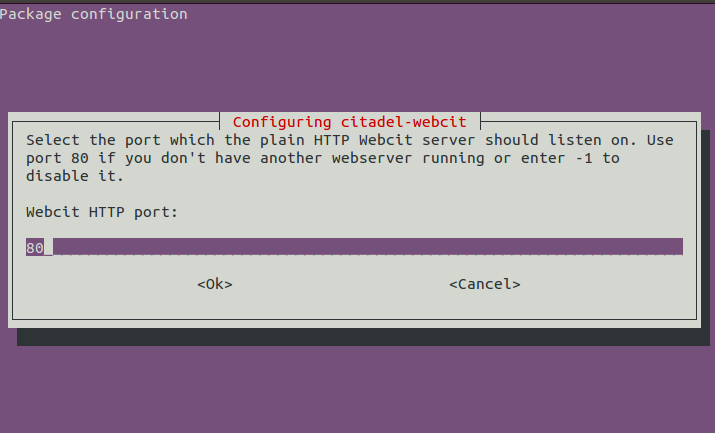 If you want your citadel server to listen to localhost and all IPs currently bound to your system, provide 0.0.0.0 here, otherwise specify the particular IP. Please choose user authentication method on the second step. The configuration wizard is pretty explanatory. On the third step, specify the administrator user name. Provide and verify password for your admin user. 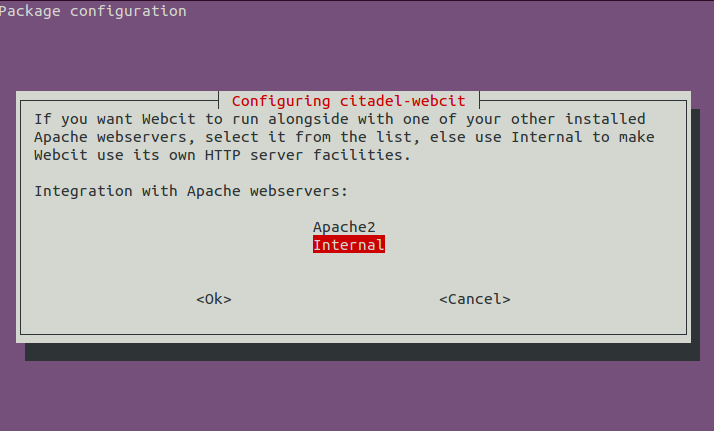 Specify how you want Citadel webcit to be configured, if you already have Apache web server installed and want to use it for citadel, choose “Apache2” from here, otherwise leave the default choice “Internal” intact and go ahead. 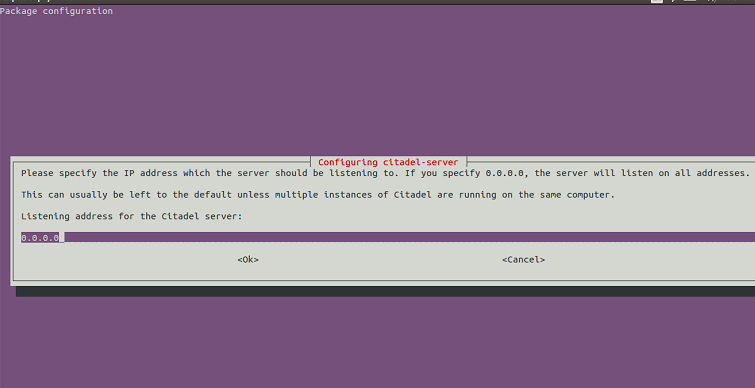 Specify the listen port for your citadel server. 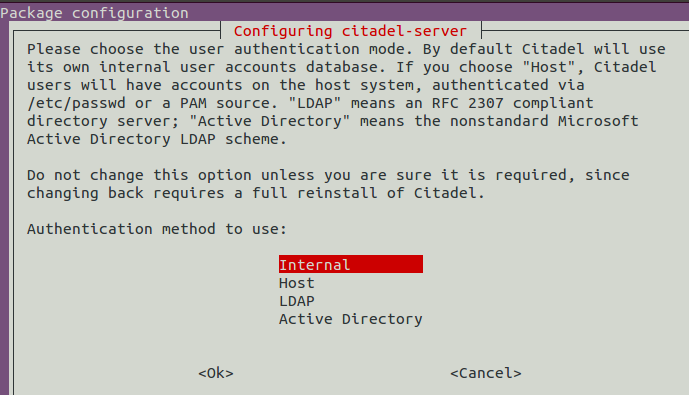 The default choice is port 80, but it you are already running some application on this port, you can change citadel port from here. 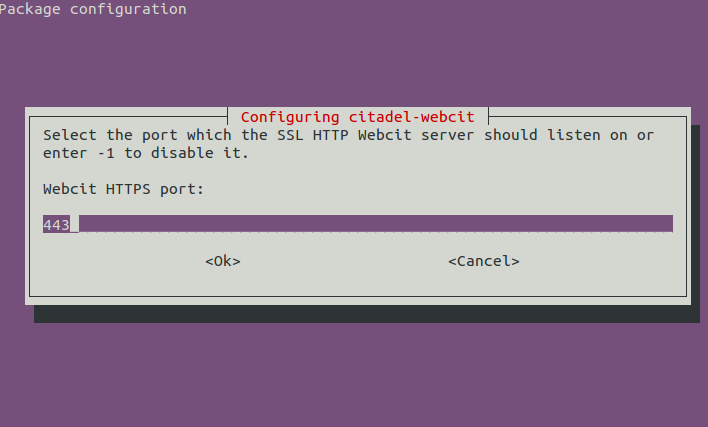 Provide SSL port for citadel here. This is to let you access Citadel web interface via secure mechanism. 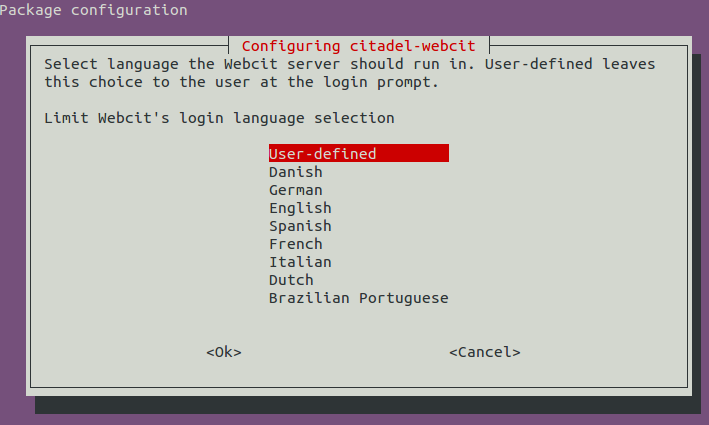 On the very last step, choose the language for your citadel server. 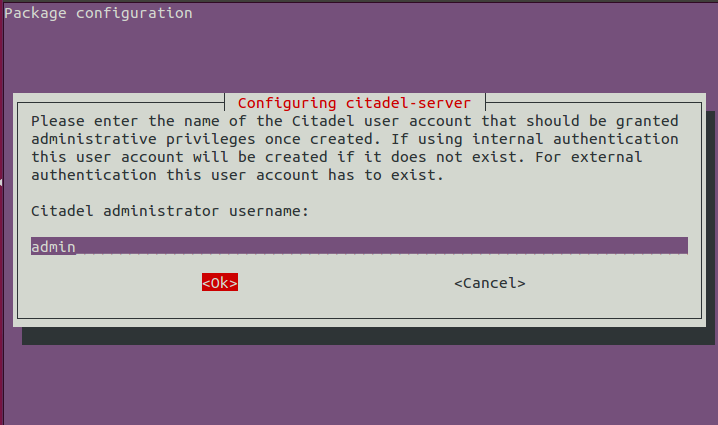 There you go, Citadel has been installed successfully now. Launch it using address http://localhost:80 – change “localhost” to your particular IP address and “80” to the port value you specified during the installation process. Citadel is a feature rich application suite, it works flawlessly on all popular Linux distributions. It is well structured, lightweight, easy to install and use groupware. It has rich internet community, try it out today, hope you will enjoy using it.